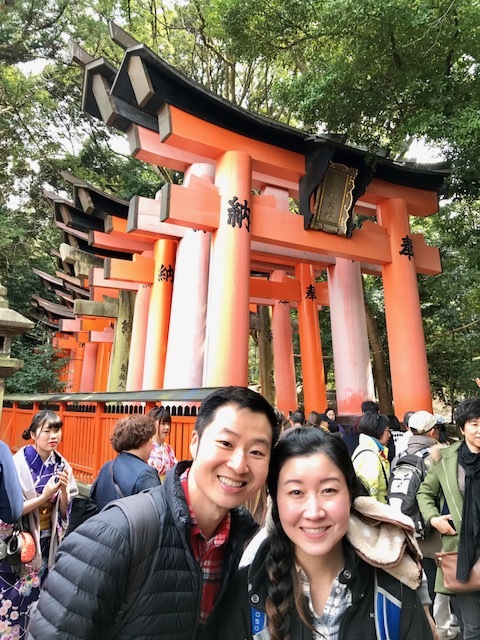 One of the most popular destinations in Kyoto is the Fushimi Inari-taisha shrine. The shrine is located just outside of the JR Inari Station. You can see it as soon as you exit. The original shrine was built in 711 AD. You can walk along paths straddled by over 10,000 red/orange (vermillion colored) Japanese gates called torii. Each of the torii is donated by a Japanese business, which has the name of the company and date of donation inscribed on the backside. Smaller torii cost around 400,000 yen and large gates can cost over one million yen. It is quite surreal and peaceful walking underneath all of these rows and rows of vermillion gates closely clustered together. Trees and the mountainside surround the entire area. Sun rays shine at you as you walk underneath the gates. While the original shrine is ancient, many of the gates are newly built. Tourists and locals alike come to the shrine daily. You will find plenty of restaurants and tasty street food just outside the area. Visitors hoping to explore the entire area can hike to the summit of the mountain and back in about 3 hours. We spent about 45 minutes walking around before our son got tired and passed out. Make sure you come here with comfortable shoes, you will be doing a lot of walking. Entrance is completely free.